First things first. No, we didn't come to Namibia because Brad and Angelina did. No, we didn't see them. No, we didn't even meet anyone who mentioned them. We were, however, shown the filming location of J Lo's movie, The Cell, which of course we haven't seen. 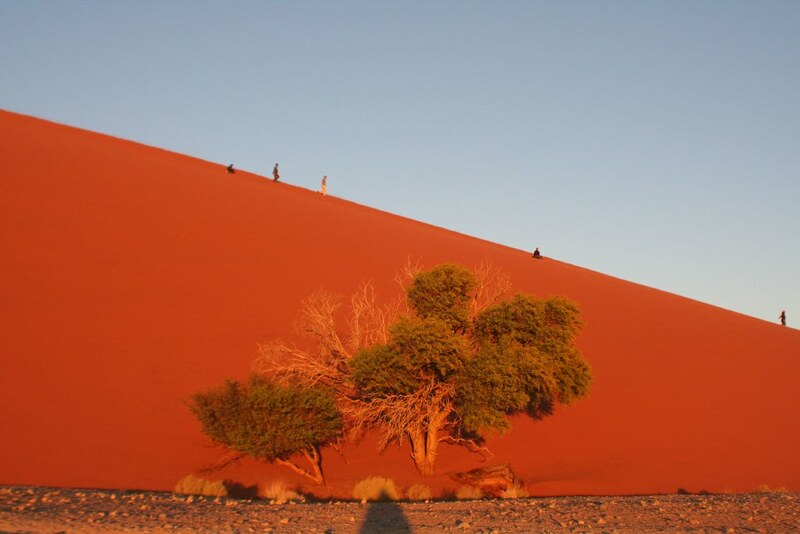 Namibia is a fairly big, relatively unpopulated country with interesting sights spread all over. Given a somewhat limited time frame, the two places we really wanted to visit were Etosha National Park in the north and the Sossusvlei Dunes in the south. Though you can rent a car and drive safely on sealed roads through much of the country, we knew we'd want to head off the beaten path at some point. So instead we opted for an organized tour where changing the tire or seeking mechanical help in the middle of nowhere is someone else's problem. Since of course we were trying to organize something at the last minute, out options were limited. We landed ourselves on Wild Dog Safari's 7 Day Southern Swing. We'd be skipping Etosha NP, but get to visit the dunes and as a bonus take in Fish River Canyon – the second largest in the world. Now that we've been on the road doing our own thing for about 8 months now, you can imagine that being herded and structured 24/7 is not really our style. Nor is riding cramped in a safari vehicle for way too many hours each day watching Kelso and Jackie snog the day away. Seriously, it was Seinfeld's "schmoopie" meets That 70s Show. But once you get past the handful of "characters" in the group, the trip was really quite nice. And luckily we had several really fun and interesting folks along for the ride making the week even more memorable. The undeniable highlight of the trip was climbing the sand dunes at sunset. Just as you think you've reached the top, you see more dunes cresting again in the distance. The slog up and over what seems to be endless dunes, is absolutely worth it. And with the glow of the late day sun illuminating the dunes, it's just beautiful. Other highlights of our southern tour were seeing quiver trees, which are actually not trees but aloe plants run amok, hearing cultural music of the Nama people, taking a stroll along the rim of the Fish River Canyon, watching the sunset over the Orange River, and exploring the diamond mining ghost town of Kolmanskoop, where half of the buildings are filled to the roof with sand (and a sign let's you know that Diamond theft hurst us all…in case you were wondering). An unanticipated highlight of the trip, though I doubt uncommon, was getting to pack up camp in the middle of a sandstorm so we could shove off to calmer parts where you don't brush your teeth with sand. Ok, well it wasn't really a highlight, but it did make things even more interesting.